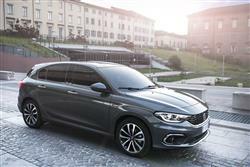 Find out everything you need to know on the new Fiat Tipo from independent vehicle review website Car And Driving. You can watch the video review to the left to see more of the car or read their written review below to get a true insight from an expert in the automotive industry. Fiat has reverted to the 'Tipo' badge for its family hatch contender, that name being Italian for 'type'. So what type of Focus-class rival is this? We're told to expect space, economy and value pricing. Sounds promising. Jonathan Crouch looks at what's on offer. Fiat is back in the family hatch segment with this car, the Tipo. Smartly styled in Italy and developed and built in Turkey, it looks a much more credible contender than anything the Italian brand has brought us in this class for decades. UK buyers get a choice of petrol and diesel engines and hatch and estate bodystyles that are exceptionally spacious. Fiat has never managed to crack the Focus-sized family hatchback sector. Over the last few decades we've had a succession of models - the Bravo and Brava twins, the Stilo, and, most recently, another Bravo line-up. None of them made any real impact on folk much more likely to either buy Ford's best seller or the latest versions of Vauxhall's Astra or Volkswagen's Golf. In recent years, it looked as if Fiat might be abandoning this traditional market segment in favour of more specialised Crossover models like their 500X. But cars like that still sell in something of a niche, so the Italian brand has, once more, turned it's hand to creating a conventional contender in this class. Arguably the last time the brand was truly competitive here was with its Tipo family hatch, which sold between 1988 and 1995. It's appropriate then, that this new model also wears a 'Tipo' badge. The smart styling won't disguise the fact that this is unlikely to be the sharpest handling car in its sector, but when we get to drive one, we expect it to be close enough to the class leaders to satisfy most potential buyers. The engine range includes five options in total. There are two turbo diesel units - a 1.3-litre MultiJet II producing 95bhp and 200Nm and a 1.6-litre MultiJet II with an output of 120bhp and 320Nm. This 1.6-litre diesel engine can also be combined with a six-speed TCT twin-clutch auto transmission. The petrol engine range kicks off with a 1.4-litre 16v powerplant producing 95bhp and 125Nm, then moves on to a 1.4 turbo petrol variant with 120hp and 206Nm. The alternative 1.6-litre e-TorQ engine produces 110bhp and 152Nm and is combined exclusively to a six-speed automatic transmission. Like its predecessor, this Tipo hatchback promises to be exceptionally roomy and is capable of accommodating three six-feet-plus adult passengers in the rear - thanks to class-leading legroom and outstanding headroom within its 4.37m long, 1.79m wide and 1.50m tall dimensions. Its boot capacity is also best-in-class with a volume of 440-litres, while the estate version adds an additional 110-litres of boot space which, at 550 litres, is also class leading. It can carry loads of up to 1.8m in length courtesy of an extra 20cm of length (4.57m), a flip-and-fold 60/40 split rear seats and completely flat load floor. The estate body style has a height of 1.51m thanks to the standard-fit longitudinal roof bars. Loading the boot of the Station Wagon estate is aided by a low load sill with reconfigurable components such as an adjustable load floor and removable side storage panels to further increase the width of the luggage compartment. At the wheel, the Tipo features numerous cabin compartments with a variety of shapes and capacities totalling no less than 12-litres. Easily reachable by driver and passengers, these compartments are perfect for storing personal objects, smartphones, game consoles, bottles and coins. Fiat knows that it will have to price this car competitively if it's to make any real impact at all on the Focus, Astra and Golf-dominated family hatch segment. So prices start at around £13,000 for the hatch, with a premium of around £1,000 for the Station Wagon estate. That means it can significantly undercut Focus prices and will be hugely cheaper than a comparable Golf. Fiat's targets here will be value-orientated platers in this class like Nissan's Pulsar, Kia's cee'd, Citroen's C4 and Hyundai's i30. Even at the kinds of figures we're talking here, Fiat will still need to make sure that this car is very well specified - and has. All UK models come as standard with air conditioning, Bluetooth 'phone connectivity, power mirrors, a multi-function steering wheel and a DAB audio system. Plus of course there are all the usual safety systems - a full complement of twin front, side and curtain airbags, plus the usual electronic assistance for stability, traction and braking. Fiat also offers some of the latest camera-related safety aids, including lane departure warning and an autonomous braking system that scans the road ahead as you drive for potential colliosion hazards. If one is detected, you'll be warned. If you don't respond - or aren't able to - then the car will automatically apply braking to decrease the severity of any resulting accident. The 1.6 litre turbo diesel engine, fitted with second-generation MultiJet technology and variable geometry turbocharger, delivers impressive fuel efficiency and low emissions. On the official combined test cycle, the Tipo 1.6 MultiJet II 120hp returns 76.3mpg and produces just 98g/km of CO2emissions. With the 1.3-litre MultiJet unit, the returns are pretty much the same. Go for the base 1.4-litre 95bhp engine and you're looking at 49.6mpg and 132g/km. Finally, a word about warranties. You get two years of manufacturer cover with this car, plus a further year from the dealer. Plus there's no mileage limitation, which makes this Fiat deal better than the restricted three year/60,000 mile package you get with rival Astra, Golf and Focus models. There's also a year of roadside assistance cover, a reasonable three year paintwork warranty and an eight-year anti-perforation guarantee. Fiat knows it has an awful lot of ground to make up in this segment. Is this Tipo the car to do it? It certainly offers a more competitive proposition in this sector than anything the brand has been able to offer for a very long time. And it can be put together in its Turkish factory very cheaply, allowing UK Fiat dealers to offer value pricing and tempting deals, yet at the same time, include lots of equipment for the money. No, it's not going to appeal to someone who would otherwise be buying a Volkswagen Golf. Or even, perhaps, a comparable Mazda3 or Honda Civic. But then here, you're not going to be paying the sort of inflated prices that tend to be attached to those kinds of cars. If you were looking at more affordable models in this sector, say, a Kia cee'd, a Citroen C4 or a Nissan Pulsar, we definitely think you should include the Tipo in your deliberations. And it's a long time since we've been able to say that about any kind of Fiat in this class.